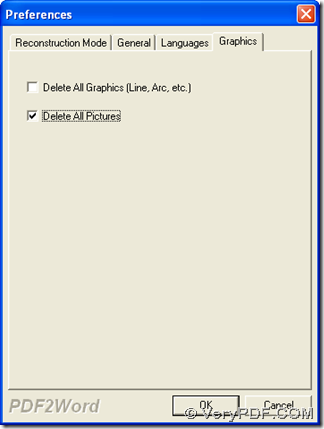 It is simple to operate once you use VeryPDF PDF to Word Converter to remove pictures from PDF to DOC on Windows platforms. First, just download installer of trial version here, then double-click installer and follow setup wizard to install it in your computer successfully. 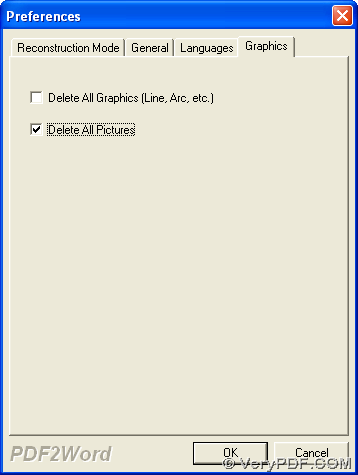 On pop panel Preferences, please click check-box Delete All Pictures under tab Graphics in order to give program a signal that you want to remove all pictures from PDF file to DOC file. This entry was posted in PDF to Word Converter and tagged PDF to DOC. Bookmark the permalink.